Asking “which gun should I buy?” is about the same as asking “which vehicle should I buy?” There is no correct answer because it depends on the purpose and preference. For this post we will stick with handguns and cover rifles later. For most folks it’s either target shooting or defense. However even if it’s strictly defense you should consider your purchase with target shooting/training in mind so you will be proficient with that weapon. Buying a S&W 500 for “defense” but never firing a live round because they cost $5 a shot is about the same as buying a Porsche but never learning how to drive it and figuring you’ll only use it for emergency trip to the hospital. If your purpose strictly for target shooting and practice I recommend a .22LR pistol such as a Ruger MKII/III or 22/45 or Browning Buckmark. These pistols are popular and accurate, excellent for plinking at the range, and .22LR ammo is affordable (when available and scalpers aren’t gouging). 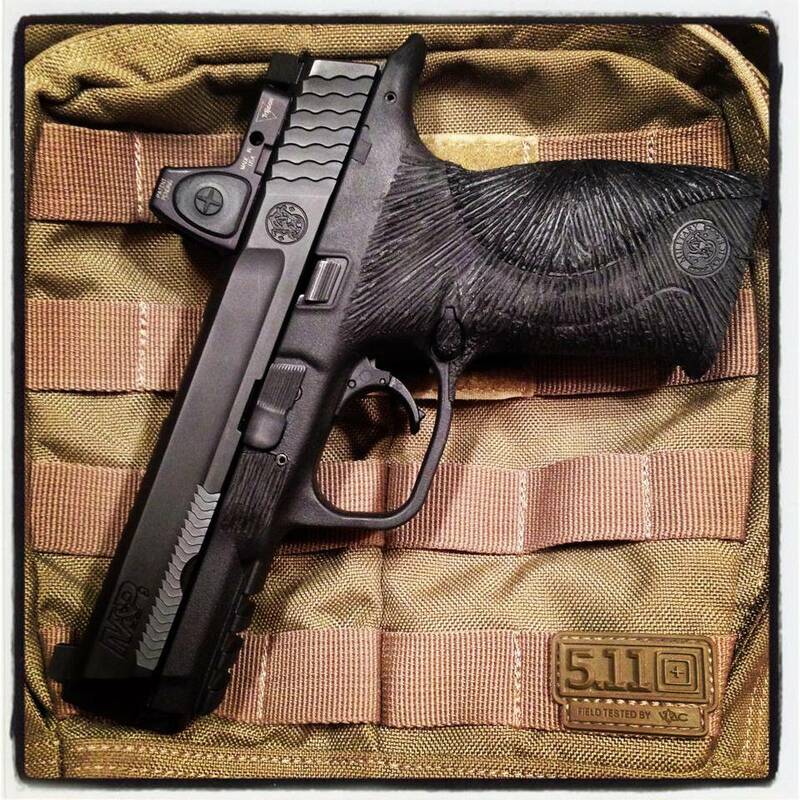 Dustin’s Ruger 22/45 project- these rimfire pistols are easy to customize. If the purpose is defense, I always recommend a 9mm. With modern hollow points the caliber debate between 9mm/40 S&W/45ACP/357SIG/380/etc is not near as important as shot placement. 9mm is the most affordable of the bunch and if you are able to train twice as much for half the cost those skills will help much more than a .035″ larger hole in a bad guy. However, whatever your final caliber choice may be, I recommend you find choose a popular caliber that you can always find at a local sporting goods store. Having to special order ammunition for your primary defensive handgun is a terrible idea. The most common handgun action is semi-automatic, but some may still opt for a revolver. If your purpose is for recreation shooting it could be a single action cowboy styled revolver, if it’s hunting you might lean towards a double action revolver that would handle larger cartridges. But this is another decision that needs to be made before pursing a purchase. If the purpose is defense, you need to decide if you wish to compromise for a smaller frame for concealed carry, or opt for a larger framed vehicle/night stand gun. Beware of tiny pistols! The smaller the frame the more difficult it is to shoot. As your sight radius shrinks so does your ability to aim precisely. As your grip gets smaller the handgun is more difficult to control and recoil actually starts to sting your hand. 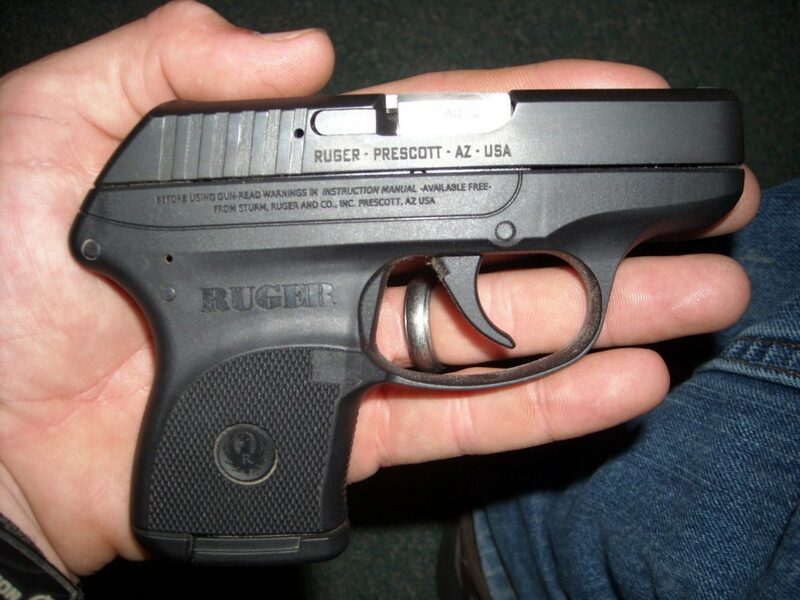 Tiny pistols like the Ruger LCP carry well, however they are not the easiest to shoot, nor are they fun to train with. But a full sized 9mm pistol will be quite controllable, easier to manipulate, and much more pleasant to train with. Full Sized M&P 9mm fitted with a Trijicon RMR by ATEi. Very pleasant to shoot. This Ruger LCP 380 is easily concealed and carried, however range time is not near as pleasant. You should always get hands on experience with your pistol before purchasing. Make sure you can adequately rack the slide, reach the slide stop lever, decocking button, safety, and magazine release without losing your firing grip. And better yet: try the trigger. If the shop you are buying from doesn’t allow you to dry fire the pistol (with the exception of some rimfires that would actually damage the gun), set it down and go give someone else business. 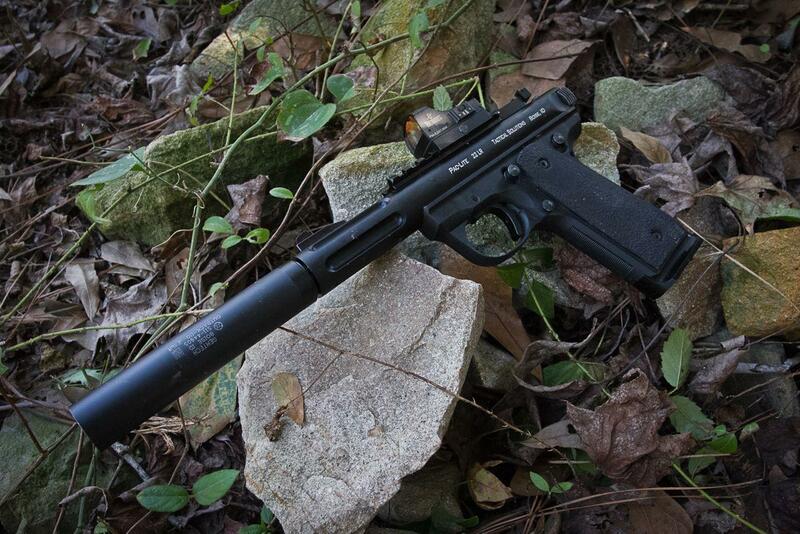 There are many different trigger actions to choose from and you need one that fits your preference. Some folks like a double action only with a long steady pull, others prefer single action 1911 style with an external safety, personally I like a crisp striker fired pistol like the Walther PPQ. You can’t go wrong with any type as long as you train proficiently, but decide this before purchasing. 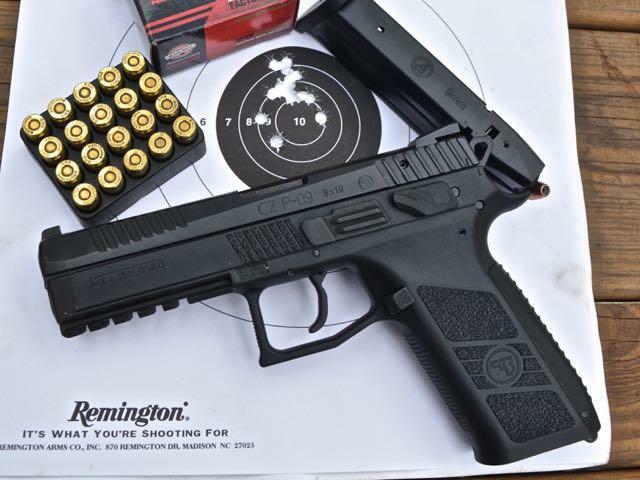 CZ P09 – another pistol I’ve tested with an impressive factory trigger. Just like I mentioned with ammunition availability, I recommend buying a mainstream pistol to make sure you can find the proper accessories for it. Buying a $1,200 pistol that you have to carry in a junky $10 “Uncle Mikes” holster is pretty embarrassing. Check the price for magazines as well, most mags run $30-40, but I’ve seen some higher end one run up to $75. This might influence your final decision. I recommend 4+ magazines for a defensive pistol. Lots of Holster Options – each serving a different function. Of course every budget will be different. But plan to spend from $300 for a basic .22LR pistol to $400-500 for a quality defensive pistol. When choosing a defensive pistol, don’t settle for the cheapest one. That’s like going skydiving and asking for the cheapest parachute. Finally, learn how to shoot. You are welcome to purchase a pistol without training thanks to God given rights guaranteed by the US Constitution, but I highly recommend getting training and learning to use your firearm proficiently. This could range from a thousand dollar weekend with a big name instructor to a free YouTube video, but widen your skill set so you can stay safe and shoot straight.